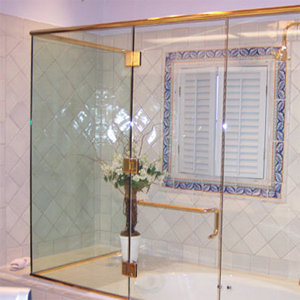 Lemon Bay Glass (LBG) delivers the very best in custom shower enclosures. Over the years we have kept pace with present day trends, LBG has introduced our clients to the finest selections and latest in technology for quality shower enclosures. until someone with experience installs it and makes it look perfect, it then becomes a piece of art. It is important to say that we use only material of the highest quality and that all these years of experience have helped us to foresee every detail that comes at the end of the installation to avoid headaches and waste of time and money. At LBG you have a wide range of options from which to choose to complete the ultimate spa retreat. Link here to review the Alumax Bath Enclosure line. Finishes to Accentuate your Design. Link here for LBG Shower Finishes. An Array of Glass options from which to Choose. Link here for LBG Patterned Glass. We stock and fabricate framed & frameless shower enclosures, sliding shower and tub doors, corner shower enclosures, custom steam enclosures and multi panel enclosures. Link here to read more on LBG and custom shower enclosures. LBG has the experience to design, engineer and install the enclosure you have in mind. Your enclosure will be measured and fabricated to fit. Your shower enclosure will be installed with the highest engineering for strength & safety. We offer products that will enhance the beauty and value of any home. All of our products are made with the utmost care to provide our customers with years of trouble-free service. Prompt, Professional, and Courteous Service. Link here to connect with listing of Design Tips. Link here to read brochure on care of Frameless Shower Enclosure. Link to connect with our Gallery of completed projects.